So all of you know me as the “food & wine guy”, but what most people don’t realize is that I was hooked on craft beer long before I ever turned into a wine geek. I may not drink it as often as I used to, but every once in a while I still love to crack open a cold one (or not that cold since good beers are best when consumed at cellar temperature rather than fridge temperature), sit back, and relax. 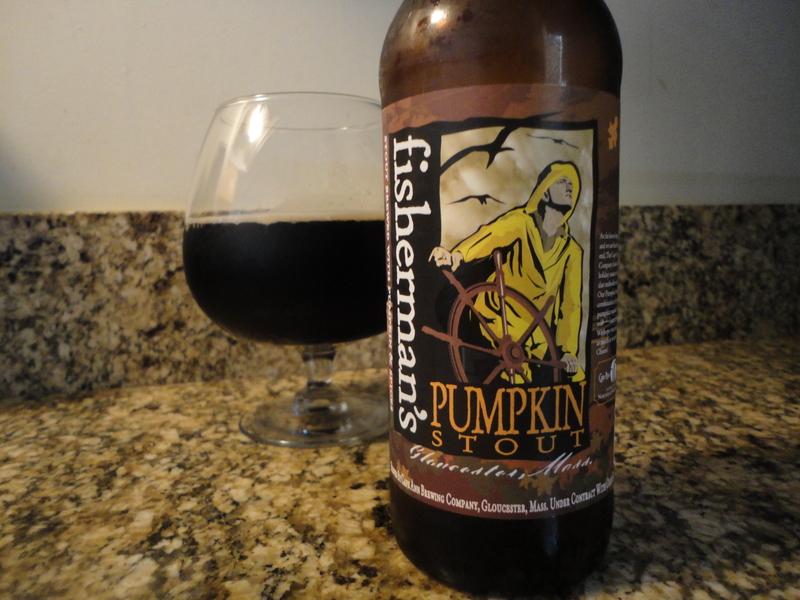 Recently a six pack of Fisherman’s Pumpkin Stout was donated to my fridge by the man that started my beer addiction, and I knew that if he was giving it rave reviews it must be something truly special! Before I even opened the first bottle I knew that this brew would be near and dear to my heart, just by looking at the label. Fisherman’s is made by Cape Ann Brewing Company, located in downtown Gloucester, Massachusetts. Gloucester is a town that was built on the backs of fishermen, known as Gloucestermen: longliners, crabbers, lobstermen. “Those that go down to the sea in ships.” The Gloucester Fisherman statue (represented by the fisherman depicted on the label) is to Gloucester and its residents what the Liberty Bell is to the city of Philadelphia… A sense of pride, a sense of purpose, a memorial to their forefathers. Why is any of this so important to me, a guy from Jersey? Because this is where my father’s family is from, where many of them still live. My grandfather was a Gloucesterman, spending his life fishing the northern Atlantic for tuna and swords. Gloucester is as much a part of me as my own home town. Just looking at the label brings me back to my childhood, spending time every summer at the harbor, eating fried clams, chowder and linguica, watching the ships come and go. Gloucester is a magical place, a fair sized town with a small town feel, someplace that everyone should visit at least once in their lives. It’s blue collar men and women that are the stuff that this great nation was made out of… It’s as American as apple pie. Alright, so I think I’ve made the point that Gloucester is a wicked-awesome place, so let’s talk about the beer. In the glass you find a dark beer of medium body, with a tan head that dissipates quickly and little in the way of lacing. On the nose are notes of spiced pumpkin pie, burnt caramel and nuances of chocolate. On the palate the beer clearly reflects the nose. Everything is nicely balanced, with no one note necessarily dominating. The pumpkin and fall spice are pleasantly subdued, something that can’t be said about many Pumpkin/Octoberfest/Autumn beers in the market today, and there are very subtle hints of bitter cocoa in the mid palate leading into a moderately smoky finish that lingers. One thing I find quite surprising is how light on it’s feet this Pumpkin Stout is. Many times stouts are a one and done scenario for me, as they can usually act as a substitute for a meal, but this drinks very clean and keeps me coming back for more. Overall, I’m quite pleased with this bottling. As far as food pairings go I’d lean towards beer braised roasts, grilled meats, ham that’s been infused with clove and honey, firm cheeses… or forget the food, sit by the fire and have a cigar! Well done Cape Ann Brewing Co., and next time I’m in the area visiting my family I’ll be swinging by for a visit!